Fund has inflows of about £25 million a week & that flows into about half of the companies held. It's also vitally important that the stock market suffers setbacks. Of course I've been buying a couple of the stocks that happen to be featured in his top 10 recently. I love a good setback. Historically it over performs in bad times, as the stocks earnings are defensive in nature. I'm kinda wishing that Apple remove FB temporarily from iPhones after the last FB scandal with them abusing their Apple issued certificate. That would certainly create a good buying opportunity! Last edited by Phil_MCR; 31.01.2019 at 15:10. You still have time, be patient with FB they have a way of screwing up all by themselves. Ad revenue and DAU growth rate is declining. Expenses are also heading in the wrong direction... my gut says they need some serious PR to recover but if there is anyone that can reach an audience its FB... and we're shortly coming up to some election cycles so the timing is actually good for them. Last edited by Dr Mick; 02.02.2019 at 21:28. You still have time, be patient with FB they have a way of screwing up all by themselves. Ad revenue and DAU growth rate is declining. Ad revenues are actually increasing -- see the latest quarterly earning report. Regarding the DAU growth rate, instead, that's to be expected given that it's about 1.5bn and FB has no presence in China. "Facebook’s management has decided to very publicly spend a lot of money on data security and content control and to improve users’ experience. In doing so it has, a) depressed Facebook’s results, albeit to a still very acceptable level — showing great results whilst under such scrutiny might be a red rag to a bull, and b) built an even bigger barrier to entry for competitors. Ironically the response to the furore may just have cemented Facebook’s competitive position." So the new fund Smithson (sson) is not available to buy for non UK residents from the FS website itself however as SSON is traded on the LSE anyone can get in that has a UK broker. This prompts a couple of questions for me that I hope some of the more informed heads on here can answer. Why is it not for sale of UK residents on the FS site if you could just buy via broker on the market? What brokerages do you use to buy on LSE & waht the trading fee you pay? 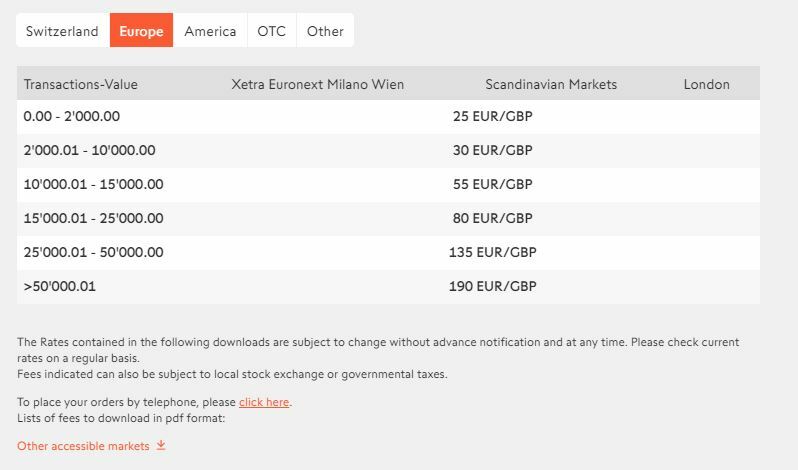 I have a swissquote account but their fees are exorbitant compared to the USD9 I'm used to paying on etrade. I'm glad they're going in the Trust route...allows me to buy through my broker if I decide to invest. I use InteractiveBrokers, like many people here. For UK stocks its minimum 6gbp per trade. thanks Enohzee, as a matter of interest is that IB account registered with your Swiss address? Yes, all fully done with my Swiss residence. No problem at all. In Switzerland you'll have an account with the IB UK company, but everything works the same. I mostly buy US stocks and it's ridiculously cheap for that. Under $100k in net assets means you pay $10 a month (minus any trading fees you paid). $10k required to open. That was for the IPO as the regulatory cost would be very high to allow direct sales with no benefit to Smithson. Clearly anyone can buy the shares now they are traded. What do you think of the Smithson Trust, fatman? I looked through the IPO presentation and it looks tempting - if they can replicate the strategy they use for the bigger stocks. I have over 15% of my net worth in the fund, I expect that to double over the next 2 years. I believe it will usually trade at a premium, substantially above the about 1.5% at the moment. NAV collapses but fund price remained flattish. it appears there were some points where you could buy at a discount to NAV. I'm currently liquidating some other under performing assets (when compared to FS, what isn't under performing in fairness?) with the intent to invest in FS main fund. -do cost average purchasing starting next week over, say, a few months. what would you do, wait & see or just go all in as it makes no difference anyway? Your collective thoughts would be appreciated.